You train hard. You put in the hours and the effort day after day. Effort is rarely the limiting factor to an endurance athlete’s performance. Efficient allocation of that effort, or training hours, can be. Athletes’ regimens often consist of a combination of hard efforts (Functional Threshold Power (FTP), Threshold, VO2 and anaerobic work) and easy efforts (easy endurance mileage) arranged depending on schedule, available friends or group rides, time and how they feel. They often repeat this schedule consistently throughout the year rather than periodizing their training to focus on specific physiological, physical and psychological adaptations required for success in their races. Furthermore, athletes are often not progressing their training toward the specific effort level required on race day. While this approach can result in fitness gains, especially in less trained individuals, it will eventually lead to a plateau in performance and ultimately fail to optimally prepare an athlete for the specific demands of their race. Specificity is arguably the most important aspect of training that is often overlooked or ignored. A well-structured training plan will progress through multiple phases, each designed to elicit specific physiological adaptations, becoming increasingly more specific to the upcoming race. The combination of these phases will result in the compounding of performance improvements that will ultimately lead to the athlete’s optimal performance on race day. The human body is an incredible machine and is capable of immense adaptation. This adaptation is determined by the stresses and strains we place on it. If we teach our body to perform at a specific intensity for a specific duration, it will adapt and improve at that task. What it will not do is improve at a task that we almost never introduce into our training. While it is necessary to train all the energy systems during training, it is the timing of specific training stimuli that will determine race performance. A coach or athlete must start with a “needs analysis” of what is required on race day and assess the athlete’s current fitness, as well as their strengths and weaknesses. The result of this analysis will guide the design of a plan to maximize adaptations for success. This plan must evolve to become increasingly more specific to the race demands if one is to expect success. 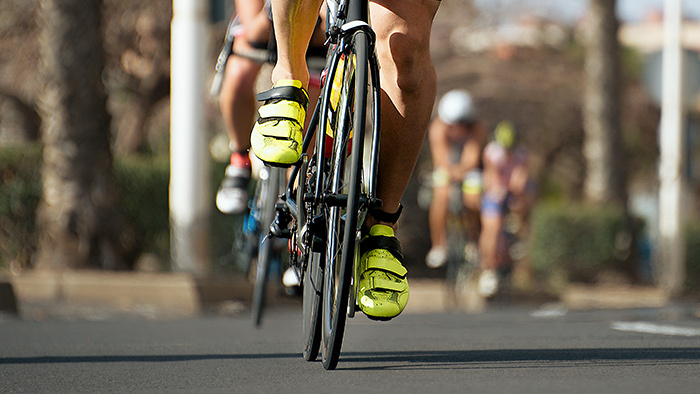 In the case of long course triathlon racing, race intensities for age group athletes tend to be around 80 to 85 percent of FTP for IRONMAN 70.3 distances and 70 to 75 percent of FTP for IRONMAN distance bike legs. It is all too common, however, for athletes to never experience these intensities for anything close to race-like durations during training. Most of the training will be focused at FTP and VO2 intensities (100 to 120 percent of FTP) or “easy pace” (55 to 65 percent of FTP). Specifically, there will be interval sessions with low durations and high intensities and there will be endurance sessions with low intensities and high durations. What will be absent is race-like intensities for increasing durations. Why do we do that? What will the body adapt to? It would be more logical to introduce race-like “stress” into training to allow the body to adapt and become better at handling it. We still want improvements in VO2 and FTP but, as we get closer to race day, we want our training to become progressively more specific. That is why introducing race-specific sessions is such a powerful tool in an athlete’s or coach’s toolkit. These sessions can be based on Training Stress Score® (TSS) and evolve from low intensity and high duration to race-like intensity and race-like duration. Over time the body will adapt to the stress and become better at handling it. Technology has made remarkable advancements in recent years and has provided us with an abundance of tools to accurately measure our efforts. Why not take advantage of these tools to ensure all our hard work pays off on the big day? Power meters on the bike allow precise measurement of our effort, making specificity in training easier than it has ever been before. Heart rate monitors and GPS on the run have been a staple of training for years now and allow real-time feedback to guide training and racing. Power for the run is a relatively new tool, but it promises to revolutionize the sport by making that feedback even more valuable, increasing the level of precision in training prescription and analysis as well as race pacing. With all these tools at our disposal, it becomes a matter of understanding, planning and implementation to create tailored and race-specific workouts and training plans that will vastly increase the probability of success on race day. We now have the capability to precisely measure the overall training stress placed on our bodies. With this knowledge we can forecast race demands with considerable accuracy and structure our training to prepare our bodies for them. Moreover, we can create a long-range plan and monitor actual adaptations versus what we have forecast. This will provide insight on the specific individual characteristics of each athlete, making precise adjustments to their training to further fine tune their race preparation. We can discover that the “plan” for race day is either too aggressive or conservative, depending on how an athlete responds and progresses through training. We can also track an athlete’s adaptation to the required race demands over time to reinforce their confidence that they are making progress toward their goal. On the flip side, the data can also alert an athlete or their coach to the fact that the current training plan is not preparing the athlete for the demands of their race. The data won’t lie! For example, an athlete who is preparing for an IRONMAN race but who likes to join his local cycling group one to two- hour road race style ride will see fitness gains on the bike, but will those gains be the ones that will be the most appropriate for their ultimate race goal? I would argue that the answer is “no.” The data will bear proof to this by showing improvement in the ability to repeatedly produce power for a break—a useful trait in a cycling road race—but not in the metrics that matter for an IRONMAN, such as four to five hour smooth power production. Fitness can be described and measured in countless different ways. It all depends what you are trying to achieve. A power lifter is fit, so is a track and field sprinter and so is an IRONMAN athlete. However, most of us would agree that if you put any of those athletes in the others’ competition they would do rather poorly. Therein lies the concept of specificity. Your body will excel at what you train it to do. Your training should create the aerobic, anaerobic and muscular foundation to maximize your (or your athlete’s) physiological and physical potential and then fine tune it to specific race demands. A well-designed training plan will create this framework in a logical and organized manner. This will guide an athlete through the multiple cycles, addressing all the energy systems, each timed specifically to build upon the previous one to maximize the overall performance gains. As the race draws near, the training should transition to ever more specific race preparation to optimize the adaptation to the particular demands of the upcoming competition. Any athlete will gain confidence by seeing their performance improve. This confidence will be a powerful motivator to adhere to the training and ultimately result in their best performance on race day. A well-constructed training plan will encompass all the primary energy systems but will become increasingly specific to race intensity as the race approaches. This will not only allow for specific adaptations that will benefit the athlete on race day but will also build confidence that the specific and planned for pace is known and sustainable for the duration of the race. The end result will be an athlete’s optimal performance on race day! Marco Nicoli is a TrainingPeaks Level 2 Coach and lifelong athlete. He played professional soccer in his native Italy until the age of 16, before leaving for the U.S. to attend Boston University. He began his endurance sports career in 2004 after moving to San Diego, and shortly after began pursuing a number of certifications, including USA Triathlon Level 1, USA Cycling Level 2, USA Masters Swim Level 2, and USA Cycling Power-Based Training. He has been coaching triathletes, cyclists and runners through his coaching business, Nicoli Coaching, since 2015.